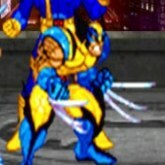 Description: When X-Men and Street Fighter collide in an all out fight you get fantastic fighting game! The character roster features 16 characters to play as, split evenly with characters from both series. They have chosen the most popular characters though, such as Wolverine, Cyclops, Storm, Ryu, Ken, M.Bison and more. All the classic street fighter moves work in this game and the same move sets work for many of the X-men characters also. Background levels are also mixed between the franchises. The real star of this game is the insane power moves each character can unleash once there power meter is full. Game Controls: Shift Key = In-cert Coin. Enter Key = Start. Arrow Keys = Move. "Z, X, C, S" Keys = Action keys. See In-game Controls for more options.